Our chemistry is devoted to the design, synthesis and characterization of innovative probes based on metal, mainly lanthanide complexes for applications in magnetic resonance imaging. We apply coordination chemistry concepts to create molecular MR imaging probes. We are also interested in fundamental aspects, such as optimizing complex stability and understanding MRI efficiency of paramagnetic systems. We cover various steps of probe development: (i) design and synthesis of novel ligands, (ii) full physico-chemical characterization of the complexes, involving the determination of individual microscopic parameters that govern relaxivity or chemical exchange saturation transfer (CEST), (iii) assessment of stability and kinetic inertness related to in vivo toxicity, (iv) in vitro/in vivo MRI evaluation of the agents. We work on MRI probes containing a self-immolative linker between the Ln3+ complex and the enzyme-specific substrate. Enzymatic cleavage initiates an electronic cascade that leads to structural changes in the complex, with concomitant relaxivity or PARACEST response. This platform has been extended to optical detection by incorporating a pyridine chromophore in the ligand and constitutes the first example where a single molecular system can be used as a responsive imaging agent in three different independent modalities (T1-weighted and Chemical Exchange Saturation Transfer MRI, optical imaging). These results have been recently published (J. Am. Chem. Soc. 2016, 138, 2913-2916) and highlighted on the cover of JACS (collab. P. Durand, ICSN, and S. Petoud). has been achieved by a synthetic molecular platform with recognition moieties for zwitterionic NTs. NT binding occurs via ditopic interactions (i) between a positively charged Gd3+ chelate and the carboxylate function of the NT and (ii) between a mono- or triazacrown ether and the amine group of the NT (figure). One probe was successfully used to monitor neural activity in acute mouse brain slices by MRI which showed for the first time that Gd3+-based probes can provide an alternative to monitor brain function under biologically relevant conditions (collab. G. Angelovski, Max Planck Tübingen, ACS Chem. Neuroscience, 2015, 6, 219-225; Chem. Eur. J. 2015, 21, 11226-11237). Zn2+ sensing: Gd3+ complexes are conceived using a modular design, by coupling a pyridine scaffold for Gd3+ complexation to Zn2+binding DPA derivatives via different linkers, which allows optimization of each part of the molecule (Chem. Eur. J. 2014, 20, 10959-10969). In an effort to visualize β-amyloid plaques by multimodal imaging, various PiB derivatives have been conjugated through different linkers to DO3A-type chelates. Affinity and interaction mechanism with monomer and aggregated Aβ1-40were assessed by various techniques (SPR, STD-NMR, CD, DLS, TEM). These results showed that even slight differences in chelate structure have important consequences on peptide aggregation and shed light on the behaviour of amyloid-targeted metal complexes in general. Although ex vivo immunohistochemical data showed selective targeting of Aβ plaques on AD human brain tissue, in vivo biodistribution with 111In- or 68Ga-analogues pointed to moderate BBB penetration in mice, even if a 2.5-fold greater BBB permeability was observed in transgenic APP/PS1 model as compared to control mice. (coll. 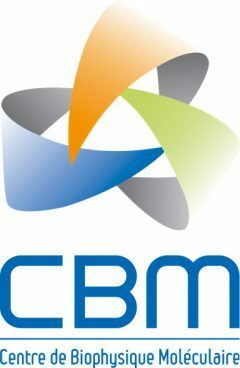 C. Geraldes, Coimbra; Chem. Eur. J. 2015, 21, 5413-5422; ACS Med Chem Lett, 2013,4, 436-440). Mn-based MRI probes. Some years ago we were among the first to “rediscover” Mn2+ complexes as potential MRI agents. Several macrocyclic structures have been explored in order to find a balance between MRI efficiency and complex stability and inertness. Our dissociation kinetic studies on MnDOTA provided the first experimental proof that not all Mn2+ complexes are kinetically labile (Dalton Trans. 2011, 40, 1945-1951). Recently, we have started to investigate Mn2+ complexes, for which the relaxation mechanism is poorly understood (J. Inorg. Biochemistry, 2016, 154, 50-59). Theragnostic probes. We are combining MRI and photodynamic therapy via molecular or nanoparticle approaches. Gd3+chelates were conjugated to porphyrin-photosenzitizers, some for two-photon excitation. We showed that their chemical association can be beneficial for both the relaxation properties and the photosensitizer (collab. V. Heitz, Strasbourg; Chem. Eur. J. 2016, 22, 2775-2786, Inorg. Chem. 2016, 55, 4545-4554). 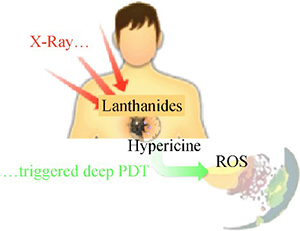 In a proof of concept X-ray induced PDT study, we took advantage of the X-ray excited luminescence of lanthanides to locally generate light in a micellar system comprising amphiphilic Ln-chelates and integrating hypericin as photosensitizer in its hydrophobic core (figure). This circumvents intrinsic depth limitations of PDT and could be synergistically combined with classical radiotherapy and MRI tracking of the probe (collab. M. Réfrégiers, SOLEIL; Nano Research, 2015, 8, 2373-2379). The MRI activities focus on preclinical research at high field (7, 9.4T) including morphological, perfusion, diffusion studies, angiography, susceptibility weighted and CEST imaging. A major force is our specific expertise in in-house design and construction of dedicated RF coils, conception/optimisation of pulse sequences and image analysis (texture analysis). Our MRI studies aim on characterizing cerebral, pulmonary, muscular and hepatic tissues in small animal models of inflammation, trisomy 21, malaria or cancer and on assessment of chronic brain exposure to environmental xenobiotics (pesticides, bisphenol A). 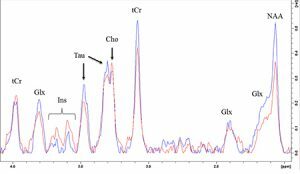 For in vivo spectroscopy, we develop 1H or 1H observed-13C edited sequences to monitor brain or liver metabolism. 1. The effect of perinatal exposure to Bisphenol A (BPA) and its chlorinated derivatives have been assessed in mouse brain and liver. BPA is an environmental xenoestrogen to which humans are regularly exposed. Chlorinated BPA products, generated by hypochlorite disinfection of tap water, show higher affinity to oestrogen receptors but their effects remain unknown. As they can be detected in human embryos, we assessed the effect of perinatal exposure to dichloro-BPA on mouse brain and liver by in vivo 1H MRS and MRI. We showed that gestational and lactational exposure even at very low dose, (20μg/kg/day) induces precocious disturbances in hippocampal metabolism and microstructure and alters lipid composition in offspring mice. These results raise questions about the risk. 2. We have evaluated bimodal targeted nanoprobes, consisting of a superparamagnetic iron oxide core covalently grafted with the NIR fluorochrome NHS-cyanine 5-5, for early stage tumour diagnosis in an orthotopic model of mammary cancer. MRI findings confirmed efficient in vivo immunotargeting of the probe to the HER2 tumor in addition to its accumulation in main clearance organs (spleen, liver and kidneys). 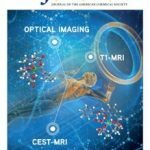 In vivo whole body fluorescence imaging was correlated with the MRI results (collab. I. Chourpa, Tours). The animal model of IUGR considered IS a model of placental hypoperfusion by ligation of the uterine artery in rats previously described by Wigglesworth et al. The parameters defined in perfusion MRI showed a downward flow (11%) and plasma volume (32%) in the placentas of fetus affected by IUGR. They also revealed an increase in the permeability of placental capillaries. The DWI (diffusion weighted images) has revealed a significant alteration in plasma diffusion (collab. C. Arthuis, Tours). Xenon inside biosensors (made of an optically active cryptophane scaffold. This cryptophane will show a high affinity for xenon) takes a specific spectral signature that enables localization of the target via spectroscopic imaging. As sensitivity of the method is still a concern, we plan to increase the contrast by conceiving a smart biosensor, for which the resonance frequency of caged xenon is different whether the biological target has been reached or not. Therefore the grafting on the xenon host of a short peptide cleavable by an enzyme will ensure that the local environment of the caged xenon atom is drastically changed, which will be translated into a consequent chemical shift variation. As the lungs are organs for which the introduction of xenon is easy, the enzyme that we will target is Caspase-1, which is activated by pulmonary inflammation (Collab. P. Berthault, Saclay, T. Brotin, Lyon,I. Couillin, Orléans). He J., Bonnet C. S., Eliseeva S. V., Lacerda S., Chauvin T., Retailleau P., Szeremeta F., Badet B., Petoud S., Tóth E. and Durand P. OukhatarF., Meudal H., Landon C., Platas-Iglesias C., Logothetis N. K., Angelovski G., and Tóth E.
Bonnet C. S., Caillé F., Pallier A., Morfin J.-F., Petoud S., Suzenet F. and Tóth E.
Carné-Sánchez A., Bonnet C. S., Imaz I., Lorenzo J., Tóth E. and Maspoch D.
Lacerda S., Bonnet C. S., Pallier A., Villette S., Foucher F., Westall F., Buron F., Suzenet F., Pichon C., Petoud P. and Tóth E.
Martins A. F., Morfin J.-F., Kubíčková A., Kubíček V., Buron F., Suzenet F., Salerno M., Lazar A. N., Duyckaerts C. , Arlicot N., Guilloteau D., Geraldes C. F. G. C. and Tóth E.
Carrouee A., Allard-Vannier E., Même S., Szeremeta F., Beloeil J. C. and Chourpa I.
Sarou-Kanian V., Joudiou N., Louat F., Yon M., Szeremeta F., Même S., Massiot D., Decoville M., Fayon F. and Beloeil J. C.
Mouton-Liger F., Sahún I., Collin T., Lopes Pereira P., Masini D., Thomas S., Paly E., Luilier S., Même S., Jouhault Q., Bennaï S., Beloeil J.-C., Bizot J.-C., Hérault Y., Dierssen M. and Créau N.
Même S., Joudiou N., Szeremeta F., Mispelter J., Louat F., Decoville M., Locker D. and Beloeil J. C.